Clear/transparent Lens - A must have for outdoor activities during dawn/dusk and any low light conditions. Protect against dust and rain when you're riding on the road, twigs and other debris when mountain biking. Yellow Lens - Great for riding or driving at night by reducing glare from oncoming traffic. Aids vision in foggy or cloudy days, by building up contrast and enhance depth perception. They are the perfect choice for mountain bikers, cyclers, hunters, and shooters. Black/Charcoal Lens - The most popular general purpose lens - excellent for bright sunny days - dark grey lenses allows true colors and reduce glare to provide day-long comfort - perfect for runners, cyclists, golfers and water sports. Brown - Great for all round weather, even better for cloudy or hazy days as brown can enhance contrast and add brightness to your vision - an excellent overall lens! *To ensure that your J+S Vision product is authentic and protected by our warranty, please purchase from the authorized seller: "jassu". J+S Vision products sold through other 3rd-party sellers may not be authentic and are not covered by J+S Vision's warranty policy. 100%, UV 400 PROTECTION - All J+S lenses have a 400UV protection rating, meaning it can block 99%-100% of both UVA and UVB harmful radiation. Ultraviolet (UV) radiation is present in natural sunlight and has a wavelength range of 400nm to 100nm. UV400 rated sunglasses are essential to protecting your eyes against long- term UV damage and keeping your eyes healthy when out and about. POLYCARBONATE LENS - PC lens are tough, lightweight, scratch resistant, have high optical clarity (distortion free, clear vision) and are up to 10 times more impact-resistant than plastic or glass lenses, making them an excellent choice for outdoor sports activities. Originally developed in the 70s for aerospace applications, they are now the preferred choice of material for children's glasses and safety glasses. BLACK/CHARCOAL LENS - the most popular general purpose lens choice - excellent for bright sunny days - dark grey lenses allows true colors and reduce glare to provide day-long comfort - perfect for runners, tennis, cyclists, golfers and water sports. PERFECT FOR OUTDOORS - designed with a moulding, encompassing frame with anti-slip legs for extra grip behind the ears. They are the perfect choice for active outdoor sports and activities such as Biking, Cycling, Riding, Mountain Biking, Tramping, Hiking, Walking, Fishing, Driving, and Rock Climbing. It is also gift packaged ready, making it a wonderful yet practical gift idea for your active friends and family! 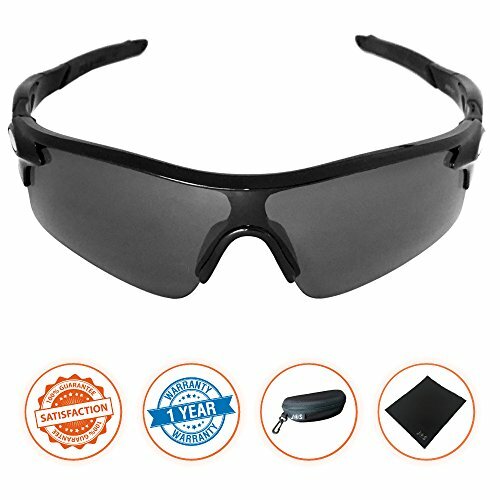 100% RISK FREE PURCHASE - All J+S Sunglasses comes with a 1 year warranty on frames and lens as well as a 30 Day Money Back Guarantee when purchased from the Exclusive authorized seller on Amazon: "jassu". So if you are not completely happy with your purchase for whatever reason, let us know and we'll take care of you. If you have any questions about this product by J+S, contact us by completing and submitting the form below. If you are looking for a specif part number, please include it with your message.